Mamma Agata's Pasta is NOW available for sale!!!!!! After more than 10 years of students asking and asking... the wait is over!!! We are thrilled to announce the launch of Mamma Agata's Pasta, our newest and most exciting endeavour that we are so excited to share with you!!! It has been a JOY preparing for this special moment when we can share the passion and LOVE that goes into the creation of Mamma Agata's Pasta. After much discussion in the family... and many dishes of pasta... we all decided to begin branding our own pasta with two of our favourites... spaghetti and pappardelle!! We invite you to come along with us as we share with you our journey about the history and secrets behind Mamma Agata's pasta! We just know you will love bringing the flavours of the Amalfi Coast and the tastes of Mamma Agata's kitchen into your own home!!! If there is one thing that is essential in our Italian kitchen besides LOVE and PASSION... it is the pasta! In our family kitchen it's a treasured ingredient... one that is such an important part of our traditional family recipes. When Mamma Agata and Gennaro are cooking for our family or for our cooking classes, we use only the freshest and highest quality ingredients... and of course this is true for our pasta, too!!! Our students have always told us how AMAZING and delicious our pasta is, and now we are so happy to share our traditional Mamma Agata Pasta... from our kitchen to yours!!! We are pleased to share with you just a few of the reasons that make Mamma Agata's pasta so very special!!! Our spaghetti and pappardelle are proudly made with only the best durum wheat and following ancient methods that guarantee a wonderful quality and flavour. Only the best for Mamma Agata!! The most delicious pasta begins with the type of wheat used, and Mamma Agata's pasta is made using only the highest quality durum wheat produced exclusively in Italy. Durum is a very hard wheat that has a beautiful yellow color, even when cooked. The hard durum wheat produces a pasta that can be cooked in the traditional Italian al dente style, just how Mamma Agata and Gennaro LOVE it!! Many pastas are created with softer wheat grains, which creates a softer pasta that cannot be cooked al dente! The pasta dough is then prepared by skilled hands before being processed by the traditional Trafilatura al bronzo - an ancient method to create pasta using bronze processing plates to draw the pasta out into the different shapes. The texture of these antique plates creates of rough and porous surface on the pasta that you can see and feel. This is one of the little secrets of pasta... that rough texture is exactly what makes the pasta absorb so beautifully the flavours of your pasta sauce!!! The next important step is the drying process for the pasta!! Mamma Agata's Pasta is dried very slowly and at an extremely low temperature, which is ideal for preserving the texture, colour and taste of the pasta. This process can take from 36 to 48 hours, which guarantees an unchanged colour and flavour for the pasta after cooking!! 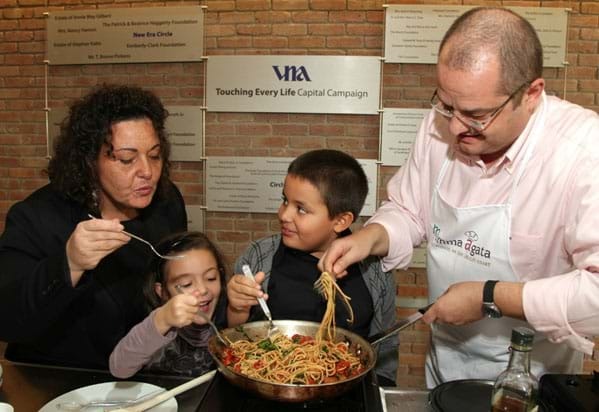 There are only a few very simple steps to follow for preparing Mamma Agata's Pasta in your home to guarantee that it will taste JUST like when Mamma Agata and Gennaro are working their magic in the kitchen!!! The biggest secret we like to share about cooking pasta is to remember to think about the cooking time divided into THREE parts... first the time the pasta cooks in the water, second the time it cooks in the sauce and third the time it cooks while you are serving it to you family and friends! To prepare Mamma Agata's Pasta to an al dente perfection, we suggest boiling it in plenty of salted water for about 5 minutes, and then draining and transferring it to your pasta sauce to continue cooking for an additional few minutes for the flavours of the sauce to "marry" with the delicate flavour of the pasta. Don't forget that the pasta will continue to cook and blend with the flavours of your sauce as you serve it to your hungry guests!!! Sometimes when you are preparing pasta, you might have noticed that no matter how hard you try it never stays al dente. This is not because you are making a mistake, but because you are not using Mamma Agata's Pasta!!! Just kidding... but only sort of, because there is truth in the joke. When pasta doesn't stay al dente, the biggest problem is often the quality of the wheat used and how it is produced. 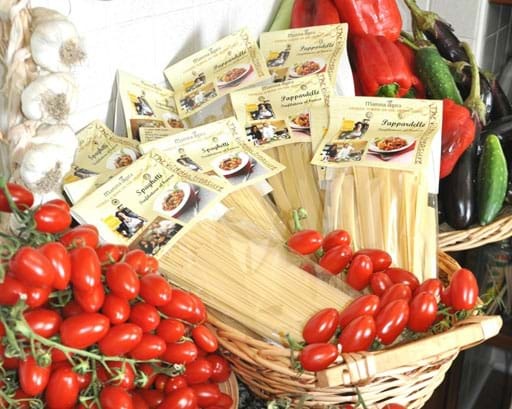 The beauty of Mamma Agata's Pasta is that it is made with only the best durum wheat from Italy and produced in the ancient method to ensure a wonderful flavour and al dente texture when cooked!!! Praise for Mamma Agata's Pasta!!! 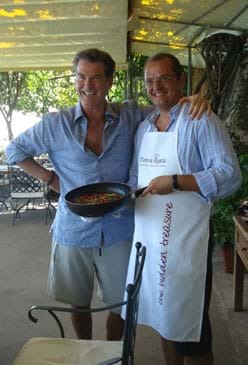 Our very dear Pierce Brosnan is just one of the many guests at our cooking school that LOVES Mamma Agata's pasta!!! 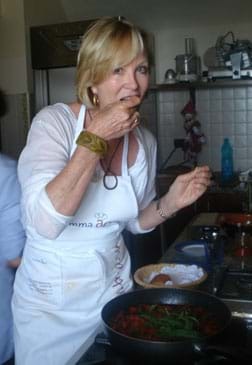 We have so many wonderful memories of cooking with 007 and preparing Mamma Agata's spaghetti and pappardelle together! Our students, including another special guest Joanna Kerns, have been raving for YEARS about how tasty and special our pasta is, and we are thrilled to have the chance finally share it... all over the world!!! Here are just a few of the very kind words we have received about Mamma Agata's pasta... but you simply must try it for yourself!!!! "We received your wonderful pasta in the mail and couldn't wait to make Mamma Agata's Farmer's Spaghetti for our family the very same day! The flavors took us right back to your terrace overlooking the sea and the memories of our very special day cooking with you. Thank you for sharing Mamma Agata's pasta... we will be ordering again soon!" "There are simply no words to describe the goodness of your pasta... I must tell you that the flavor of the grain is incredible. 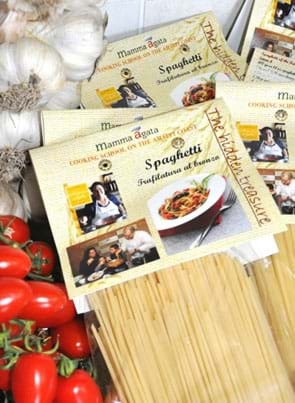 Mamma Agata's pasta is so good that it can be eaten without any type of sauce!" "There is pasta... and then there is TRUE Italian pasta! Mamma Agata's pasta continues the tradition of artisan made pasta that is heads and shoulders above regular store bought pasta. You have made my family very happy knowing we can enjoy a taste of Italy in our own home!" 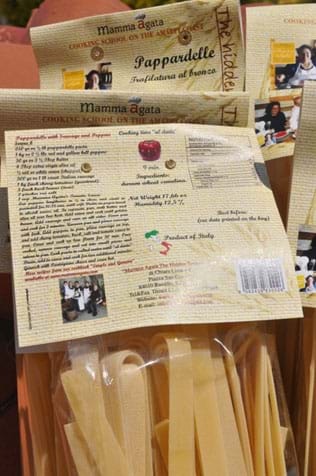 We are happy to announce that Mamma Agata's Pasta is now available for sale online in the Mamma Agata's Shop on our website at www.mammaagata.com!!! 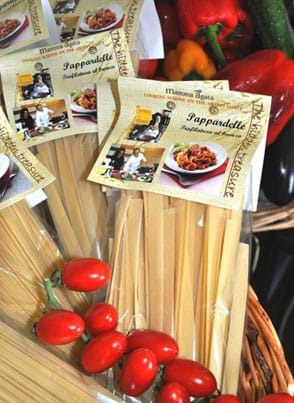 Each 500 gram package of spaghetti or pappardelle costs €4.00, and we are happy to ship ANYWHERE in the world. You can find many special offers available for sale now on our website!! 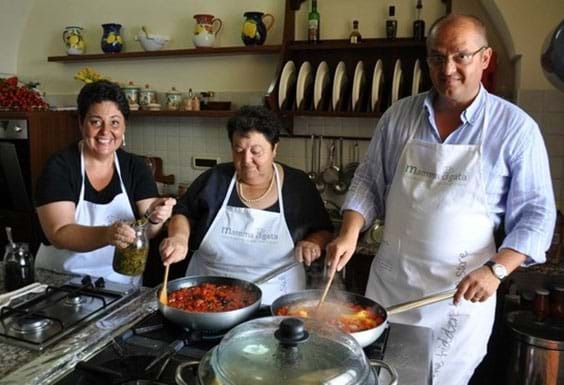 Bring the flavours of Mamma Agata and Gennaro's cooking into your own home!!! Each package of our spaghetti and pappardelle pasta includes a treasured recipe from our family kitchen on the reverse making it a PERFECT gift for the holidays, Christmas, Easter, or maybe a birthday present for a dear friend... for ANY OCCASION!!! We would be so happy to hear of any grocery stores or specialty food shops... big or small... near your home that might be interested in carrying our pasta. We are happy to ship anywhere in the world... and the bonus is that you'll be able to find Mamma Agata's pasta in a store near YOU!!!! 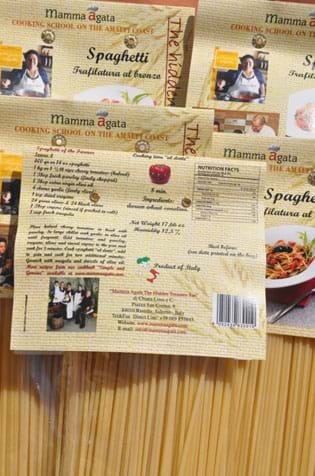 Visit our website for all the information on Mamma Agata's Pasta, or contact us directly at info@mammaagata.com for details on special orders and shipping to other destinations... we will be so happy to help! Recipes for Mamma Agata's Pasta!!! We are happy to share Mamma Agata's favourite recipes from our award-winning cookbook Mamma Agata: Simple and Genuine, which we are proud to announce is in its THIRD edition! Each cookbook now includes a new band on the cover featuring the Gourmand Best in the World Award for 2010, which our cookbook was honoured to receive in the category Best East Recipes - second only to Jamie Oliver!!! 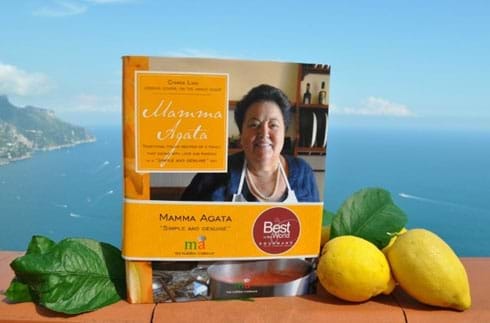 You'll find many more pasta recipes in cookbook Mamma Agata: Simple and Genuine, and we know you'll enjoy combining with love and passion Mamma Agata's family recipes with a taste of Italy with Mamma Agata's Pasta! !